Home is where the heart is. But what if your home has been swept away in a catastrophic flood? Miami beach resident Bruce Bender represents one of millions of U.S. homeowners that are threatened by this reality with each and every hurricane that makes landfall. He shares with reporters how he is “completely, absolutely, one hundred percent desperate” (Harris, 2018). Due to climate change, sea-level rise is affecting Miami the hardest. Bender explains how he has to roll his pants up to his knees, to walk from his home to his garage, and he has photos of his home flooded in water a foot deep (Harris, Gurney, 2018). With sea level rise already impeding on life in Miami, hurricanes only worsen the problem and cause more damage. Hurricanes cause flooding, and climate change leads to more intense hurricanes which have worse floods and damage. As a hurricane hits land, it creates a rise in sea level called storm surge. A hurricane creates a storm surge due to the low pressure, large waves, and high wind speeds associated with its conditions (University of Illinois, 2010). Due to this rise in sea level, hurricanes cause flooding especially along coastlines, like those that Miami face (Loria, 2018). Due to climate change, hurricane flooding is only getting more intense. When the sea surface temperatures (SST) rise due to climate change, more seawater evaporates, increasing precipitation during hurricanes and other storms (Wang et. al, 2018) . This concept is similar to a sauna, where once you warm the coals to heat the sauna, the water you pour in quickly evaporates, creating more intense amounts of steam. When the sea surface temperatures rise, there is an increase in evaporation which intensifies hurricanes. Floods resulting from this increased precipitation damage coastal communities. Miami plans to start its combat against climate change through a 400 million dollar general obligation bond called “Miami Forever”. The program’s main mission is to create future livability in Miami while trying to find more cost effective ways to withstand the environmental changes brought on by climate change (Smiley, 2017). Passed in Florida’s 2017 elections, the bond is intended to be paid back through property taxes and what’s more is that it will not raise property taxes for Miami residents. Instead, residents miss out on the reduction in tax rates they’d normally get when the city finishes paying off its old debt (Stein, 2017). Although the expected decrease in property taxes will not be coming to Miami residents anytime soon, they will not be paying extra for what this program, and voters, hope to achieve. Before this program came to pass, voters passed the Stormwater Master Plan in 2012 and granted stronger water pumps to a few of Miami’s streets most impacted by floods. These pumps are capable of pumping 14,000 gallons of water per minute and were reported to be keeping the once regularly flooded streets relatively dry soon after implementation (Flechas, 2014). This program failed, however, because it failed to take into account local sea level rise projections for Miami so the pumps were not powerful enough (Stein, 2017). Mousavi et al. (2011) predicts climate change will cause the sea level to rise about one foot as soon as 2030. As tidal flooding continues to get worse in parts of Miami, Miami Forever should focus its sea level project efforts on installing more pumps. Updating Miami’s storm water drain system with more pumps will prevent Miami from hemorrhaging more funds into restorative projects, adding an overall cost effectiveness to the program. Although it’s important to note that these pump are only a temporary fix–like a band-aid over a deep wound–experts state it will give Miami a 30-40 year buffer for more conductive solutions to be made (Flechas & Staletovich, 2015). Generally speaking, a city’s stormwater drain system consists of multiple storm drains, manholes, and basins from which storm water enters. It then flows through a series of well chambers and interconnected cylinder pipes before reaching an exit point; typically a nearby body of water (“MDOT Stormwater Drainage Manual”, 2006). Pumps are added along this pathway to help better guide the body of liquid by increasing the fluid’s static pressure. The water enters the pump inlet point and is fed through a turning, motorized impeller using centripetal forces to suction water into its center, or “eye”, before exiting an outlet point at higher velocity (“HEC 24 Highway Stormwater Pump Station Design”, 2001). Because there is no one-size-fits-all when it comes to water pumps, determining the pumps strength, or how many gallons of water it needs to move per minute, is based off different calculations discussed later in this paper. 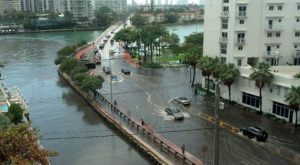 As climate change continues to be realized, Miami continues to be hit the hardest with rising sea levels, as well as increasing hurricane storm surges and precipitations (Wang, et al. 2018). Miami’s stormwater drain systems need to be equally equipped in any way it can be and should be the program’s first steps in mitigating these water increases and limiting the damages caused by hurricanes and tidal floods. There is currently a project underway to raise the roads of miami beach to prevent flooding. This will cost the city about 25 million dollars (Flechas, 2014) and the funding for this project is just the beginning to solving the problem. Miami beach is only a part of Miami-Dade county and a very small part of the Florida. If these measures were implemented to the rest of the county they wouldn’t have the same financial impact. There wouldn’t be as large a need for raised roads and the funding can go to installing pumps. Additionally if there is still need for more funding it can be found with the various businesses found in the county. During major storms and hurricanes they have to close down from the flooding and wind, but if they each gave a small percentage of their loss from the flooding to fund the project there would be more than enough to fund the project. Even though there is less than a 1:1 ratio for the money spent on prevention and money saved by the flood prevention. There is still money saved to the people and the businesses. There is no specific date to only pump flooding prevention cost benefits so the data is also skewed by including the costs of raising streets above sea level. Let’s look at the effectivity of this solution. This answer comes as one of the least costly and most effective. As we know, most any problem can be solved if we throw enough money at it but in a time where funds need to be distributed over a broad range of enterprises, we can’t spend it all in one place. A category 3 hurricane, Norbert, dropped 464 mm of rain per hour at peak measurements which equates to 18.27 inches per hour. (Black, 2012) The reason this particular hurricane is of importance is how recent it was, 2014, and the amount of rain it dropped for the relatively low category number. Now unfortunately we are going to have to come to the realization that this amount of rainfall simply cannot be diverted into places to avoid flooding. However there is a way to calculate the amount of drainage in gallons per minute needed to help with the surplus of water during flood level events and keep flooding to a minimum in low sea level areas. Miami covers 55.25 square miles. This roughly equates to 289,935 gallons of water per minute for one inch of rainfall over one square mile. When hurricanes make landfall and the amount of rain being dropped is found, it’s a simple calculation to find how much water needs to be pumped out of the city and what size pumps should be installed or how many. There are many companies who make pumps ranging from 1,000 gpm all the way to 100,000 gpm and can be utilized in two ways. One way is a hard mount and the pump never moves. This way would be used preferably under ground or at a pumping station which takes all the water from the city and pumps it into the ocean or reservoir after being disinfected of chemicals and contaminants. This is much how city water systems work. The other type of pump is a movable configuration and is typically used as needed. Imagine you’re filling your bathtub with water but the drain can’t handle the amount coming in from the faucet. Once the water reaches the drain flip on the side of the tub then it can handle additional water. This is how the movable pump would be used and would be great for those areas in the city that have a lower average altitude and thus accrue more water and need additional support. Installing them to the existing storm drain infrastructure would minimize costs and increase effectiveness of the system. A 50,000 gpm pump could easily be integrated to the system at a rate of 6 per square mile to drain the water from, for instance, a hurricane like Norbert. Bruce Bender is one of many home and business owners who are desperate to find solutions that will make their quality of life at the coast more sustainable. Stronger drainage pumps are not the only solution to Florida’s flood problem, but it is a practical approach to a much larger and complex issue in which they cannot afford further delay. If there is one thing we can be certain of is that climate change is here and creating more intense hurricanes. Combined with a rising sea level, another side effect of climate change, and recipe for disaster is likely to ensue upon coastal communities as has been the case for Miami, a major U.S. city. NOAA reports that the U.S. has seen 25 500-year hurricanes since 2010, in which the U.S. has paid a little over 300 billion dollars in damages for just 2017 alone (Ingraham, 2017). If even a portion of that cost can be reduced by adding stronger drainage pumps it could give coastal communities like Miami time to respond and reevaluate the framework of their society’s infrastructure. The millions it costs to install these pumps are alarming but nominal when compared to the billions it could save in flood damages. Adding stronger drainage pumps could be the starting point that allows for more permanent solutions to be made.